People know a lot about the benefits of peppers, so it is very often cultivated by gardeners for their plots. But the peppers grew better, his seedlings from time to time it is necessary to feed. Seeds to successfully germinate, they need to awaken. This procedure is simple. To do this, soak the seeds in a warm steam bath for 30 minutes, then wrap them in a damp cloth, leave in the fridge for 1.5-2 hours. Take any growth factor, prepare it a solution, in which place the seeds for 20 minutes, then it is safe to plant them in the ground. - after 2 weeks the amount of fluid increase, only the soil must not be too wet. As fertilizer ideal and ordinary mineral fertilizers: azofoska and ash. These fertilizers feed the peppers under the scheme. Increase the number of feedings during picking. But the composition of the fertilizer does not change. Organic fertilizers are prohibited for pepper as manure. These fertilizers will bring in the future a lot of trouble - they will develop the part of the plant that is above ground, but the roots are not even affected. Before planting pepper on a summer residence, prepare the soil. Put 1 teaspoon of the fertilizer into the prepared holes for pepper. Bell peppers cannot tolerate chlorine, so please carefully review the composition of the fertilizer. Once you put fertilizer in the hole, fill the top with water and wait until it absorbed. After that, we can start replanting. Just proceed carefully so you don't accidentally damage the roots of plants. After planting, seal the ground around the pepper. After that for a week forget about watering until the pepper will settle down. As soon as the sprouts will be new greens, go to the fertilizer potash fertilizers without chlorine. Here, too, it is very important not waterlogged soil, water bell pepper fertilizer 1 time in the fortnight. More and it is not required. Often beginner gardeners wonder why bother to feed pepper. 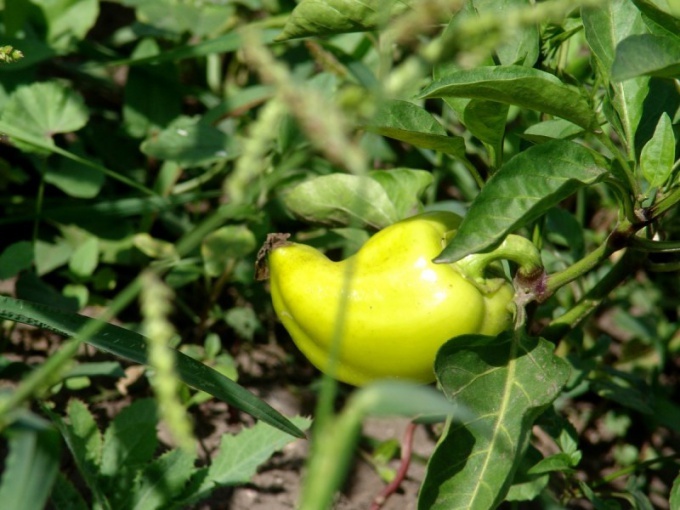 Bell pepper can be attributed to the capricious vegetables. When it lacks nutrients, high-quality crop possible and not to think. Therefore, the feeding of the pepper should be approached in good faith, to in the fall to enjoy the fruits of their labor.